As one of the most favorite foods in the world, some people may want to make pizza on their own. It is due to the fact that buying pizza might cost a bit money than making it by yourself, and sometimes the purchased pizza failed to satisfy the consumers’ taste. A problem also arises with delivered pizza. There is also much time when the pizza delivery shows up late with cold pizza. Pizza ovens are a multifunctional oven that is able to cook various type of pizza effortlessly. Well, everybody loves pizza, this food that comes from Italy has its own charm, and therefore, it is always a good idea to have the best pizza ovens that you can purchase in order to make your own Pizza. There are several pizza ovens with good features and price out there, and for your information oven pizza is different from your ordinary oven that you usually own. The mechanism for pizza oven is much more complex and has some additional features that ordinary oven does not have. Therefore to help you in your search for finding the best oven for pizza in 2019, here is some of the recommendation that we have made for you. The first best pizza oven that we will try to describe in this article is the Deeco DM 0039 IA C Aztec. This oven really has long names but how about the features? the first feature of this oven is the design that similar with Aztec temple hence the name, with the stylish design and shape, this oven also introduce a large number of features from fiberglass lining so heat will be locked up inside, rain lid with removable feature and also screed door with hinged spark guard design. This oven also made with cast iron and can cook 14 inches pizza. The oven comes with $499 price ranges. If the Deeco is too pricey and you want a smaller oven, then Pizzacraft PizzaQue can be your next choice. This oven comes with the price under $200 and also offer unique features such as the propane-fueled oven that can be used for the outdoor activity. Additionally, there is a preheating mode that can cook the pizza in a more efficient way and also the addition of 14 inches cordierite pizza stone. The net pizza oven is the camp chef Italia artisan oven. This oven has cool features such as double layered ceiling that is perfect for heating and can bake pizza similar to the traditional brick oven used in Italy. There are also gauge monitor for internal temperature and also micro adjust the valve to give you precise control for the heating. This oven also quite affordable for an oven pizza and can be taken for outdoor use. The price of this oven is around $300. The next best pizza oven that we will be talking about is the Pizzeria Pronto. 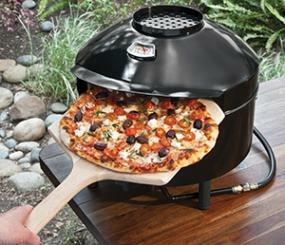 Just like the other Pizzacraft oven, this oven is made to make pizza and also can be used in outdoor. The features range from faster 10 minutes preheat and also the portable design that is perfect for a picnic. This oven also has a high 700F cooking temperature. With all of these benefits, this oven comes with a really affordable price. This modern style oven with unique looking design and shape comes with $202 price tag and offer faster heating mode and also can be used in outdoor environment. Additionally, this oven is pretty easy to use and does not take too much space. This features, of course, makes this even worthy to be called one of the best pizza ovens. We come to the sixth place which is taken by the Blackstone brand with its great features ranges from push-button igniter that also comes with steel handles. Additionally, this cheap pizza oven also comes with 6.000 BTU burner which is very fast and quick for heating the food. 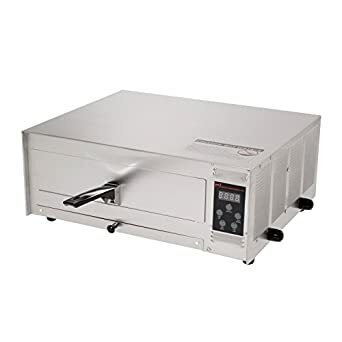 To make things better, this oven which is considered as one of the best pizza ovens is priced for $360 and also has the same power as the brick oven. The last of the best pizza ovens of 2019 which included in this list is Wisco 425C-001 Digital Pizza Oven. This stainless steel pizza oven has the cheapest in price among other ovens. However, you don’t have to worry about the quality this oven has. It has a long life calrod heating elements and flip-up handle design for easier storage. For the price, this oven cost between $80 to $100. Those 7 pizza ovens are the products we recommend to you who want to make a pizza easily without having to wait a long time. So, which is the best pizza oven you choose? Having the best pizza oven is a must for you especially when you want to make a great pizza restaurant. Then, that is the main reason why you have to follow several tips on how to choose best pizza ovens. So, it will be so much better for you to check them out below. It is so much necessary for you for you to choose what type of pizza oven that you really want to have. In this case, you have to make sure that you choose the particular oven that can suit your requirements the most, whether it is pizza deck oven, wood-burning oven, conveyor oven, and much more still. By doing so, you will definitely be able to find the best pizza oven that can work awesomely functionally and complement the decoration of the cooking area at once. It is actually so much recommended for you to buy a pizza oven on the online stores that you can find so easily on the internet. There will be so many various options for pizza oven which are available for you at the very affordable prices. Then, the best thing about it I that, you can still have the chance to get an interesting discount that you will love so much. In the end, all of them are the tips on how to choose best pizza ovens. By doing all of them, you will have nice guidance in order to find the most right that can work the best for you. Thus, you will never feel disappointed after you have added the pizza ovens in your cooking area. How to care your best pizza oven is probably one of the most important things everyone who has outdoor pizza oven should know in the first place. For everyone who pretty much loves outdoor activity, the outdoor pizza oven is among the most needed furniture thanks to its function. However, due to its constant use and smoke it emits as the result of cooking, it is prone to anything you do not want to be found on pizza. But, you will also be glad to find that there is not much to do for cleaning it. Here are the steps to cleaning your pizza oven in a spell. Just like any traditional oven does, it produces salt as the result of baking the pizza. If it’s not removed soon, it can disrupt the cooking process and even corrupt the taste of pizza you are baking. You do not want that to happen, do you? Well, just sweep off the ash inside the oven with a small sized sweep to make sure there is no ash left inside. If you think that cleaning the ash off the pizza oven will suffice the process, then you are wrong. There is another thing you have to do on how to care your best pizza ovens related to the previous process. In this case, you need to sweep the dust off the surface which might have been left from initial cleaning. Just like the ash, it can also corrupt the taste of pizza, so note to yourself to clean it. The last step on how to care your pizza ovens is to rub the surface from small dust and anything left out of previous steps as the final step and all that.